Grand River Development Limited, a company managed by the Taipei based real estate private equity investment company Riant Capital Limited, today announced its plans for Taipei’s most anticipated redevelopment, Taipei Sky Tower. 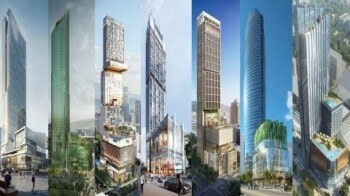 TST is planned to be a mixed-use commercial landmark building at the heart of Taipei’s CBD. Located next to Taipei 101 in Taipei’s prime Xinyi District, TST promises to redefine “luxury and efficiency” in the retail and hospitality sector upon its scheduled completion in 2020. The planned 54-story tower will be over 260 meters in height and comprise of approximately one million square feet in combined floor area. The building is planned to consist of a retail podium, luxury hotel, lifestyle hotel and a state-of-the-art theater house. “Due to the unique location and street front exposure of the site, we are able to re-create a new whole pedestrian block comprising of independently operated retail and F&B flagship/concept stores that one typically finds in major international cities such as New York, Tokyo or Hong Kong. We believe that this pedestrian shopping experience will offer consumers an attractive alternative to the traditional department store concept and that our innovative approach will further enhance Taipei Xinyi District’s status as a premium business and retail center in Asia,” said Aaron Chan CEO of Riant Capital. Despite the slowing global macro-economic condition, Riant Capital is confident in Taiwan’s prospect as becoming a key tourist destination in Asia. As such, Riant Capital shares a view that the retail and hospitality sectors have strong potential to achieve steady growth. The effect of the growth may be further compounded given the limited supply of international quality retail and hospitality properties in the Taiwan market. The acquisition and redevelopment is expected to cost US$ 1.1 billion and is currently the largest single investment managed by Riant Capital. The acquisition marks one of the largest real estate transaction led by a PE fund in Asia and the largest deal done by a PE fund in Taiwan to date.